Paul McCartney's latest music video 'Appreciate' is quite revealing for us -- while creepily instructive. The video is "Presented by Microsoft", takes place in the Year 3116 and introduces Newman the Robot (as in "New Man"). Newman the Robot is touring a human museum in a future where presumably humans no longer exist. Newman is drawn to the McCartney exhibit and ultimately they join together in dance. (Click photo to enlarge)We bring this up because of the recent reaction to Neil Young's new album A Letter Home which uses 1940's era recording technology. 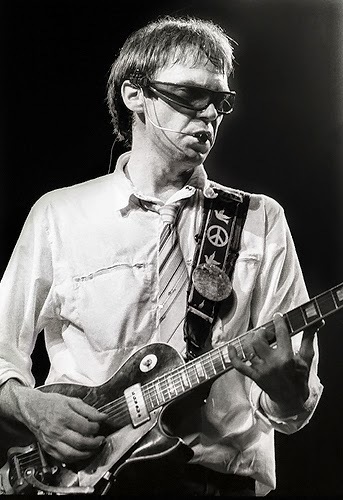 It seems that some Neil Young fans are finding A Letter Home a bit too retro for their tastes. So we pose the following question: Which artist is using technology most creatively? 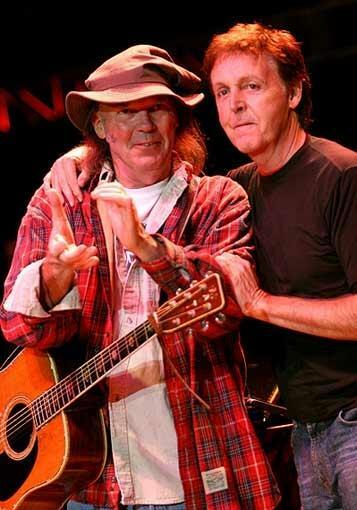 While this might seem a like a cute little game to play, consider how much of peers Paul McCartney and Neil Young are in their long history together. And consider how much the artists are taking two very different paths today in 2014. Clearly, Young is on another of his journeys through the past and excursions into alien -- yet familiar -- territory. Using a 1947 Voice O'Graph recording booth for his latest album A Letter Home, some have observed that it's "so archaic, it’s cutting edge". "The technological singularity, or simply the singularity, is a hypothetical moment in time when artificial intelligence will have progressed to the point of a greater-than-human intelligence, radically changing civilization, and perhaps human nature. Because the capabilities of such an intelligence may be difficult for a human to comprehend, the technological singularity is often seen as an occurrence beyond which the future course of human history is unpredictable or even unfathomable." 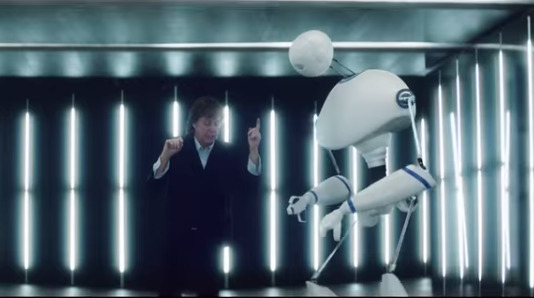 So to recap, McCartney and Microsoft are working together on robot technology. Neil Young and Jack White are working together on vinyl recording technology. Speaking about Newman, McCartney said: "I woke up one morning with an image in my head of me standing with a large robot. I thought it might be something that could be used for the cover of my album NEW but instead the idea turned out to be for my music video for 'Appreciate'. Together with the people who had done the puppetry for the worldwide hit War Horse we developed the robot who became Newman." 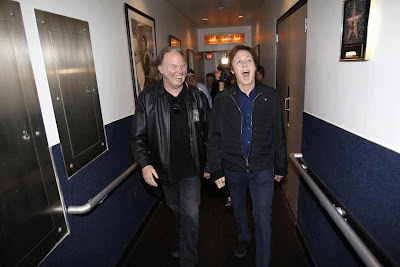 More on Paul McCartney and Neil Young. I don't think "Which artist is using technology most creatively?" makes any difference. I think "Which artist is making music you like?" is a better question and neither is one of your choices. How about "Which artist is selling his product to make a microsoft ad and which isn't?" @07:50:00 AM - yes, wee need to post on this as soon as we have more artwork avail. @doc - ok, fair question. Want to take a crack at answering? @Dan1 - as part of the "armchair critics" crowd, actually challenging folks like McCartney & Young to stay relevant is part of our raison d'être. And its all so fascinating comparing Paul & Neil's latest efforts -- they couldn't be more polar opposite it seems. Paul's effort projecting out centuries into the future while Neil looks back a few decades. And exactly on Neil seeming to say all the matters is the song & the feeling. Out of the whole album, for us, some of the most compelling material is Neil's "letter home" to his Mom. It seems so genuine and heartfelt. Apparently, completely spontaneous right off the top of his head. @Aaron - Sponsored by Someone and Sponsored by No one. >> McCartney and Microsoft are working together on robot technology. 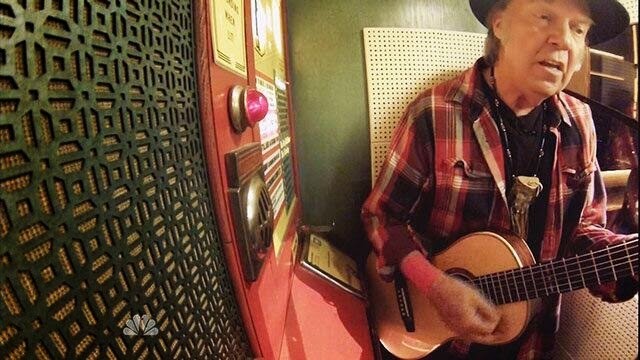 Neil Young and Jack White are working together on vinyl recording technology. and here I thought McCartney was sounding quite 80's on this one. 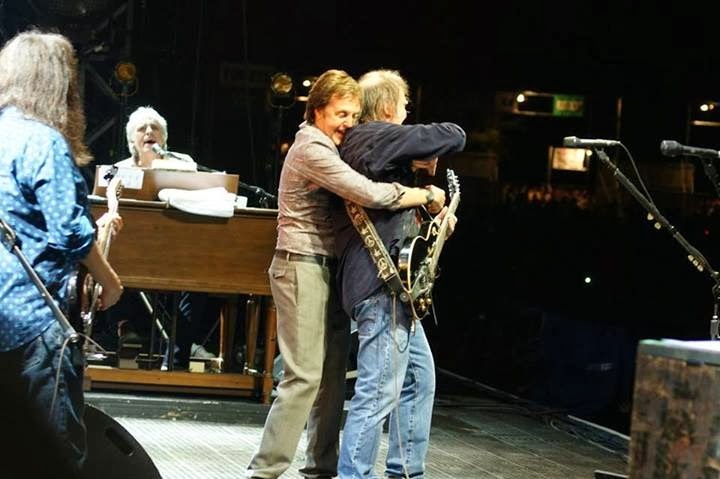 Two Titans of the industry, songwriters, musicians and vocalists extraordinaire, each placed in the Halls of greatness of music creation and delivery, between them a century of hip still going strong. Great to have continued creativity and production outta these two. We're lucky to be traveling through history at the same time with them. Sorry Thrasher, I just saw this > @doc - ok, fair question. Want to take a crack at answering? I just don't like the non-Crazy Horse sounds Neil's been putting out. That being said if I only owned 1 NY album it would be 1 more than how many PM albums I'll ever own.